Posted By:Unknown | At:10:59 PM Be the first to comment! 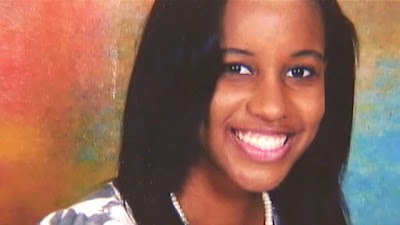 The search for missing honors student Phylicia Barnes came to a heartbreaking end Thursday, after an autopsy determined that a body pulled from the Susquehanna River Wednesday was that of the North Carolina teen who vanished from Baltimore in December. Two law enforcement sources said the autopsy determined that the body was Barnes’s; state police later confirmed the finding. An apparent tattoo on the body, which was found in the waterway that splits Harford and Cecil counties about 40 miles northeast of Baltimore, looked to match a tattoo of a rose that Barnes, 17, had on her lower right leg. Barnes disappeared on Dec. 28 from her half-sister’s northwest Baltimore apartment, touching off the Baltimore Police Department’s most extensive and elusive missing-person search in years. With the discovery of her body in state waters, state police will now assume control of the investigation. Messages of condolence were flowing in by the hundreds to a Facebook page called “Pray for Phylicia Barnes,” which had nearly 23,000 followers. Baltimore police have repeatedly gone on national television, encouraged family members to speak publicly and sought help from law enforcement agencies across the country. They put up billboards, searched a streambed and drained a well behind an apartment associated with someone who knew the missing girl. Authorities have not ruled out that Barnes was the victim of a random abduction. Detectives have been perplexed by a lack of physical evidence, with no one coming forward with a credible tip or sighting. Barnes, who lived with her mother in North Carolina, was visiting her half-sister Deena Barnes in Baltimore for Christmas. The track star and honors student had planned to graduate early from high school and attend Towson University. Police said they found nothing in her background to indicate that she would run away or become a victim of a domestic dispute. They said she had no psychological or legal troubles. Categories: Black and Missing, Phylicia Barnes, R.I.P.